Romans? Yes, well no one quite knows what impact Roman occupation had on population structure. David Reich’s team is working on 1000 new samples from Iron Age and Roman Britain. * One of the issues they are apparently looking into is what effect Roman presence may have had on the population of Britannia, which the Romans occupied for a little over 360 years. They occupied parts of Dacia for a little over 160 years. We shall see if anything relevant for Dacia can be inferred by analogy with the upcoming Reich study on Roman Britain. More Global 25; this time with Maps. Green denotes tighter model fit; the more intense the green, the better the fit. Continuing with some of the Chalcolithic models with good fit for modern Romanians in post #111. The most intense green is for Romania, followed by Bulgaria, then Turkey. Last edited by Fungene; 12-02-2018 at 01:42 AM. Visually, the model restricted to Coțatcu yields a better result for modern Romanians. Nice model, I know that the closest fit is not the priority for you here, but I'll just mention that using the Romanian:Average creates the illusion of a closer fit than the actual average, if you were to average the fits for each individual. I've done that just for testing purposes, with the same settings as in the web nMonte (double check if in doubt). Without counting me, the average of these 10 Romanians is 3.2 vs 2.1 for the Romanian:Average with pen=0 and 2.3 with pen=0.001 (your case). Also, don't use the penalty, because you are comparing 3 or 4 very different populations. The penalty is meant for populations who are hard to distinguish between (e.g. Irish and English), so the calculator will artificially attempt to pull towards the closest single distance fit. Also, just a heads up, as you realise there's also minor ancestry present in Romanians and, ignoring me, 4/10 absorb some pure East Asian ancestry when it is introduced. Now obviously, the reference is completely irrelevant, geographically speaking, but we simply don't know how this type of ancestry spread in Romania in the 1st place. Did it stuck after being introduced by Scythians? Is it from Cumans, Bulgars, perhaps Mongols or Tatars? There are more questions than hard data when it comes to this. Last edited by Dorkymon; 12-06-2018 at 03:30 PM. using the Romanian:Average creates the illusion of a closer fit than the actual average, if you were to average the fits for each individual. What illusion? Each model has a fitness score. Averaging fitness scores across different models does not produce an interpretable magnitude. The illusion of a tighter fit for that model. Each model has a fitness score. You don't say, we also call it a "fit" around here. Averaging fitness scores across different models does not produce an interpretable magnitude. I didn't bring different models into this discussion, so I don't see how this makes any sense. 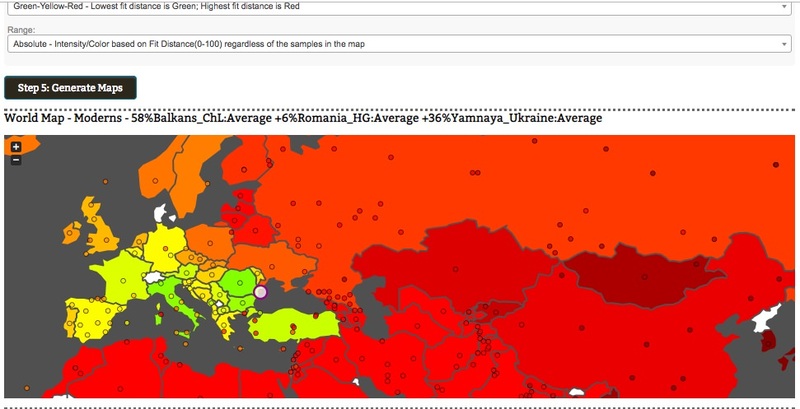 I've reproduced the test for each individual with the same model that you have introduced (i4089 + Yamnaya_Ukraine + Romania_HG). Well, it certainly isn't, as you've said it yourself on the previous 2 pages. Otherwise you'd focus on the Iron Age and work with the available Scythians and Balkans_IA from Northeastern Bulgaria. You're just reading this in isolation. I have a long post on Scythians and also one that includes tips on relevant historical reading. We don't have samples from Romania past the Chalcolithic. And we can easily get the appearance of a tight model with overfitting. More on some of these issues when I have time. Also, just a few short comments: we should, by-and large, look at more recent events (russification, transfer of populations, eg.Tatars by Ottoman empire) for the issue that seems to be of preeminent concern to you. The introduction in medieval times of some minorities, such as Szeklers, is also relevant. Djuvara and Boia are popular, but simply can't stand up in comparison with the work of Stahl and Spinei. What wealth of information, especially the endnotes and footnotes! I have to say, reading Stahl's Contributii la Studiul Satelor Devălmașe Românești, originally published in 1958, reedited 1998, is an absolute must (including the endnotes; amazing material; one can see how shoddy Djuvara and Boia are in comparison.) This is a third recommended reading, but first in order of importance. The nMonte stuff, as Poi recently wrote, is meant for good fun. Some of your comments look desperate. Reread what I have written carefully.